What a way to start this new challenge than with what is closest to me right now, Mental Health Advocacy, more importantly eliminating the stigma that comes with the diagnosis. I think often that most people would be surprised to know how many people they interact with daily are diagnosed with some type of mental illness. Watch the news on any given day and there is sure to be an act of violence, neglect, or public incident that will be immediately be related to the person’s mental state. It is this type of news stories that have shown that anyone with these illnesses should be put away and not allowed in society. This is much of the reason I am silent about my illness, or have been – until now. I was diagnosed with Bipolar Disorder in 1996, to say the journey has been a rocky one is an understatement. I have been lucky to be admitted to the hospital only twice, and I have fought with everything I have to stay healthy, listen to my doctors and learn as much as I can. It’s complicated though, at least for me, not only am I Bipolar, but also live PTSD (Post-Traumatic Stress Traumatic Stress Disorder) , Anxiety, DID (Dissociative Identity Disorder), and OCD (Obsessive-Compulsive Disorder). To me, it simply means I have more letters after my name than most doctors, and for some reason, my brain was wired wrong. The PTSD and DID, unfortunately, result from years of severe abuse, and from what I have learned does play a hand in my other disorders. I thought for a long time that I had to hide who I was, wear a mask so to speak, but over the years, I have begun to find by hiding who I really was I was losing myself. I am NOT my illness; I am a person who wants to live and enjoy each day and fight with everything I have to stop the stigma and ugliness that come from the admittance of mental illness. In October 2013, a Chicago Bears wide receiver was fined for a uniform violation. His crime you ask? Since October is Breast Cancer Awareness month players were required to wear pink, instead he chose to wear green cleats in honor of Mental Health Awareness Week. He stood up for what he believed was right, in support of someone he cares about and was punished for it. I give him a standing ovation, and I believe many have as a way of saying thanks for doing what many of us can’t. With each day, I hope that we come another step closer to stopping the ignorance and stigma that are directed to those who are not able to speak for themselves and accept one another for who we are. Everyone has a story and it is time I told mine. 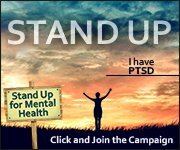 Will you be the next to stand up?